Like other specialized services, freight forwarding is like baseball. The best teams cover all of the bases, and know how to flex positions to get the job done. We have specialized equipment and staff at all of our corporate locations, as well as the flexibility and technology to provide stateside logistical standards to locations thousands of miles away. We offer personalized service to all of our clients. From the initial quote to the arrival of your freight at its final destination, our experienced team of professionals will customize a solution to meet your individual shipping and delivery requirements. Our long-standing relationships with quality ocean line, airline and trucking partners ensure our quotes are competitive. We use state of the art technology to organize and centralize all customer shipments past and present, and customer information to enable our team to provide you the same efficient service from any one of our locations. 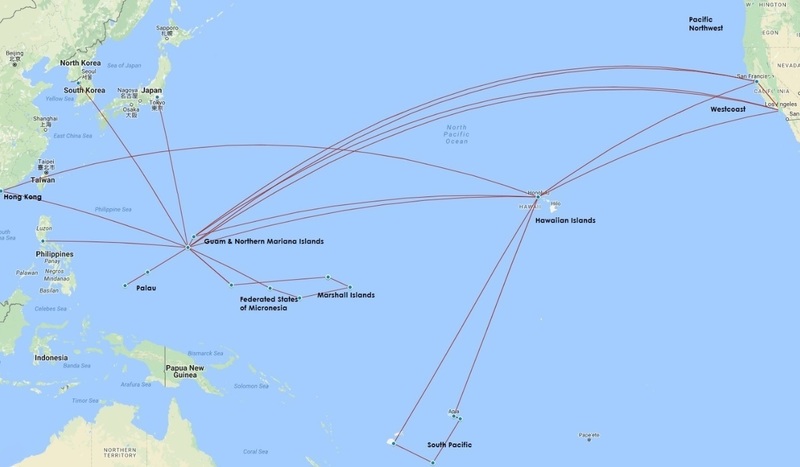 In addition to US Domestic transportation services, the map below shows the Pacific routes that we specialize in. Please continue to scroll below to see the types of services we offer. Please note: the map below is only of our most common routes. We have over 40 years of experience shipping all over the world, Internationally, all over the Continental U.S., Alaska, and Puerto Rico alongside. We offer a wide range of consolidated air freight forwarding services to most destinations around the world. Our comprehensive, international service network, combined with our world-class team of professionals, can candle all of your air freight needs, including pick up, customs clearance, delivery, and distribution operations. Our dependable, worldwide, scheduled consolidations and door-to-door transportation services ensure short lead times with the security and reliability your business requires. We also offer air charter services as required for emergency situations, unusual consignment shapes and sizes, or if you have a need for an unscheduled air freight shipment. As a leading Federal Maritime Commission Non-Vessel Operating Carrier, or NVOCC, with more than 40 years of experience shipping to and from the Pacific Islands, we have the ocean carrier relationships to offer frequent departures for full container load, or FCL shipments to and from major ports around the world. Our expert consolidation services can combine smaller less than full container load, or LCL shipments going to the same destination port to give you lower ocean freight shipping costs. Our extensive network of FCL and LCL carriers can handle almost any commercial shipment. We offer standard 20 foot and 40 foot ocean shipping containers, as well as 40 foot and 45 foot high cubes, and 20 foot and 40 foot refrigerated containers, in addition to special equipment for oversized, out of gauge cargo. "We continue to be impressed by the customized logistics solutions offered by Triple B Forwarders, Inc. When faced with shipping challenges, Triple B has always found a door-to-door, cost efficient, and time saving solution, allowing our company to stay one step ahead of the competition." - Rachel Weston, Distribution Center Manager, Grabber Construction Products, Inc. In August of 2007, President George W. Bush signed the Implementing Recommendations of the 9/11 Commission Act 0f 2007 into law. Included in the legislation is the provision that 100% of all cargo transported on passenger aircraft be screened, with a three year implementation timeline. As of August, 2010, Triple B Forwarders obtained certification from TSA to screen our customers’ air freight shipments through the Certified Cargo Screening Facility Program (CCSP) to operate as a CCSF at our Los Angeles and Honolulu locations. Our logistics management professionals can help you meet your customers' demands through efficient and effective planning, control, and implementation of timely and accurate shipment and storage of your goods and equipment. We have been leaders in international freight forwarding for more than 40 years because of our world class safe and swift transport of even the most complex products by air, ocean, and ground for customers in any industry.